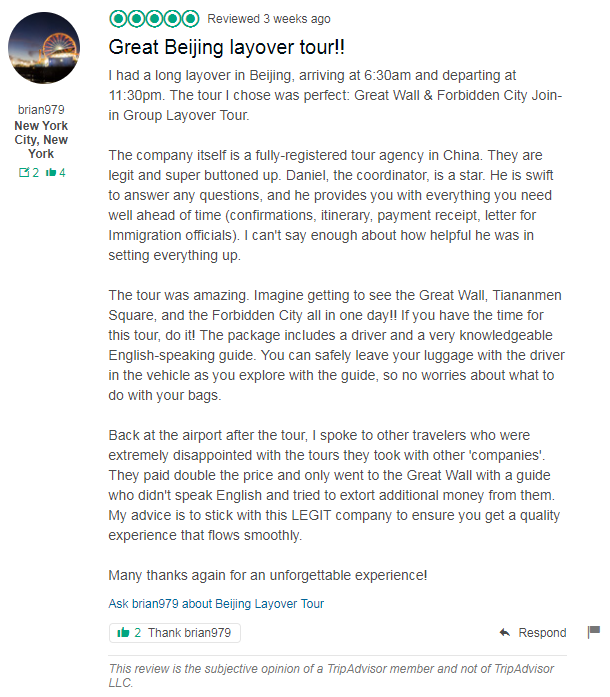 Tour Description: You will find our private tour guide waiting for you at the arrival hall of Beijing airport, holding a paper sign with your name on. Take drive to the city center in our private car. First visit the Tiananmen Square, and the Forbidden City, the best preserved imperial palace in the world and a UNESCO World Heritage. 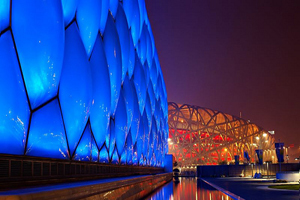 Move on to the Olympic Green to visit the modern Bird’s Nest and Water Cube, perfect for taking photos with. After tour, be escorted back to the airport. I will be arriving into PEK at 12:00 and departing at 02:35 the following day. Will it be possible to do this tour once I arrive? Yes, you can do the tour once you arrive. We just sent you an email about the tour details, please check. HELLO, LANDING BEIJING AT 11:45PM EVENING, JUST BEFORE MIDNIGHT. IS THERE ANY TOURS WE CAN DO DURING THE OVERNIGHT LAYOVER. LEAVING AIRPORT AT 11AM NEXT MORNING. THANK YOU FOR YOUR HELP! Sorry, we do not have tours suitable for you. Hi, I´m going to Beijing tonight, is there any chance to do this tour by midnight? If so… please let me know the rates, I´ll be landing from Guangzhou at 12:40, and will depart tomorrow 22n December 10:00 am to USA. Thank you for your message. Sorry, your arrive Beijing time is too late. We do not have tours at that time. Hi Greg, Thank you for your message. Our travel advsior tried eamil you, but we noticed your email address is incorrect. Could you please let us know your correct email address?